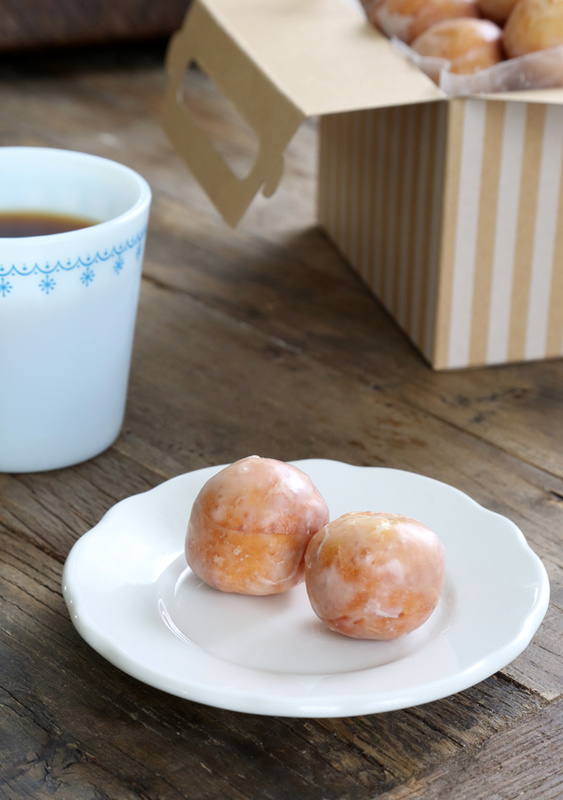 Glazed Gluten Free Donut Holes | Great gluten free recipes for every occasion. So, yeah. You can guess what happened next. And it turns out that the Yeast-Raised Donut Dough from page 151 of GFOAS Bakes Bread makes the perfect Dunkin Donuts munchkin donut hole copycat. Now before anyone starts throwing tomatoes at me, claiming that this is some sort of horrible, evil “advertising scam,” although of course I prefer the new sort of bread dough from GFOAS Bakes Bread, and of course I want you to buy my newest book, the yeast-raised gluten free donut dough of days gone by here on the blog still works and actually works very well. It’s one of the best old-style gluten free bread dough recipes I have, in fact. You can see from the step by step photos that the donut holes are not perfect circles. Rather than rolling the dough into rounds, I use a small round cookie cutter to cut out shapes from the dough. 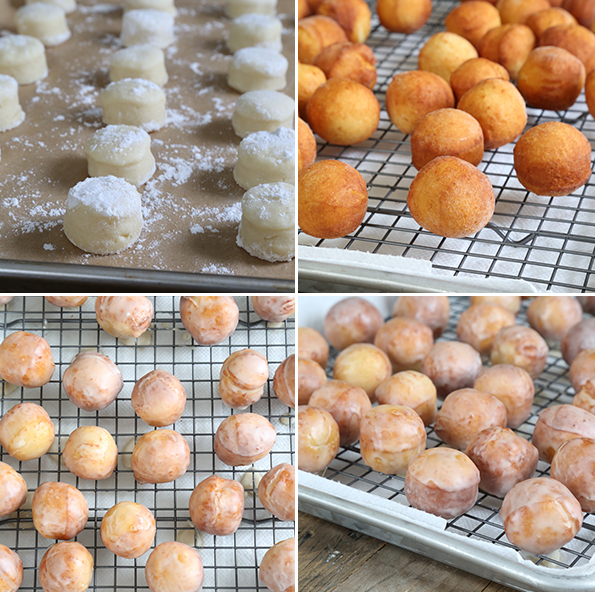 If you try to roll rounds of dough between your palms, you’ll compress the dough and the fried donut holes won’t be the lovely, light and fluffy little gems they are meant to be. So I don’t want to pressure you, like my son didn’t want to pressure me. But I will say that these gluten free donut holes really do taste just like the ones that come in that box from Dunkin Donuts. And even if it’s already getting steamy outside where you live, frying doesn’t heat up the kitchen like the oven does. Everybody wins! Especially my gluten free son. He won BIG. First, make the donut dough. Once the dough has undergone its first rise, shape and cook it as follows. If using the donut dough from GFOAS Bakes Bread, turn out the chilled dough onto a lightly floured surface and, using the scrape and fold kneading method and using a very light touch, sprinkle the dough with more flour and knead it lightly, sprinkling with flour when necessary to prevent it from sticking, scrape the dough off the floured surface with a floured bench scraper, then fold it over on itself. Repeat scraping and folding until the dough has become smoother. Do not overwork the dough or you will incorporate too much flour and it will not rise properly. If using the yeast-raised donut dough from the blog, prepare it according to the recipe directions, but do not knead the dough. With either dough, roll it out on a lightly floured surface into a rectangle about 1-inch thick, sprinkling very lightly with flour to prevent sticking. With a floured round cookie cutter about 1-inch in diameter, cut out rounds of dough and place each piece on a greased, parchment-lined baking sheet. Cover with lightly oiled plastic wrap, and set in a warm, draft-free location to rise for 30 minutes, or until puffed but not doubled. With either dough, as it is nearing the end of its rise, place about 3-inches of frying oil in a medium-size, heavy-bottom pot or fryer. Clip a deep-fry/candy thermometer to the side of the pot or fryer, and place the oil over medium-high heat. Bring the oil temperature to 350°F. Place the raised donut holes a few at a time in the hot oil, taking care not to crowd the oil. Fry until very lightly golden brown all over (2 to 3 minutes per side). As soon as each batch is removed from the fryer, place on a wire rack placed over paper towels to drain and cool completely. 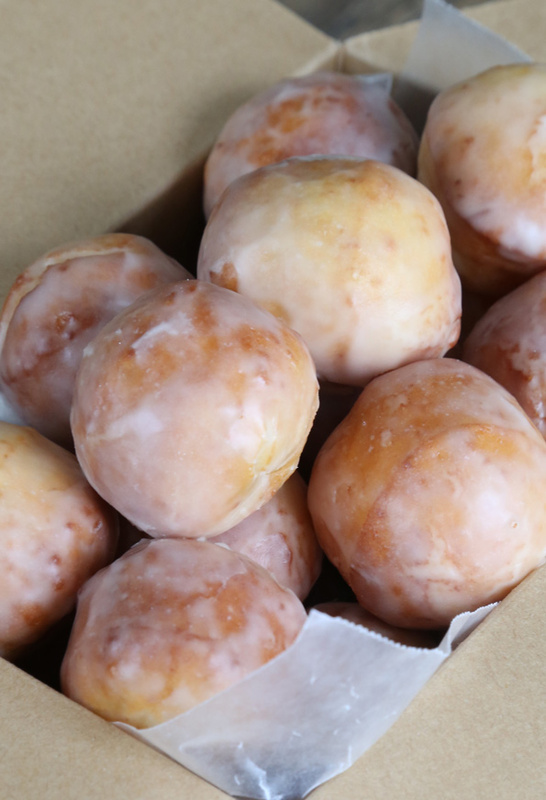 While the donut holes are cooling, make the glaze. In a small bowl, place the confectioners’ sugar and 1 tablespoon of milk. Mix well, until a thick paste forms. Add more milk by the 1/4-teaspoon, mixing to combine well, until the glaze falls off the spoon slowly, in a thick but pourable glaze. Add milk very slowly, as it is much easier to thin, than to thicken, the glaze. If you do thin the glaze too much, add more confectioners’ sugar a teaspoon at a time to thicken it. Immerse each cooled donut hole in the glaze and lift out with the tines of a fork or chocolate dipping tool, and return to the wire rack for any excess glaze to drip off. Allow the glaze to set at room temperature and serve immediately. Stumbling Over Chaos :: Linkity wishes Ms Mayhem a very happy 8th birthday tomorrow! I suggest you check out all of my books on amazon.com, Ali. You can see the tables of contents of each in the “Look Inside” feature and then make the choice that seems best for you. Laura, did you use a stand mixer for the dough? i dont have one and im wondering if these are possible to make without one. Yes, I didn’t use a stand mixer and they turned out great! I can’t wait to try this. Thank you. All I have to say is… om nom nom. Hi Nicole! Just want to say thanks for all you do! These look amazing! Also thanks for always including step-by-step photos! It helps a ton. When you quick print your recipes, is there a way to have it add the photos? Xoxoxo! I LOVE that these can be made dairy free, which I now am, and somehow surviving ;) Thank you for this recipe! Definitely adding it to my list!! I personally limit my soy intake (except for gf soy sauce and edamame – I’m a sushi lover). I use unsweetened almond milk for most substitutions. Even for mashed potatoes, it works well and doesn’t change the taste at all. Excited to make these! is it possible to make the dough without a stand mixer? i soooo want to make these for my 16 yr old son who was recently diagnosed with Celiac. Mmm! I never bought doughnuts before I became GF but it seems they’re all I want recentl.I’m one of those that doesn’t know what they have til its gone…BUT its not gone, thanks to you!! Cant wait to make these! I’m working on a recipe for chocolate donut holes. Stay tuned! choc donut holes sound great! niclole, since i do not have a stand mixer, how would recommend mixing the dough? My heart breaks for these young ones. It’s hard to do without when all your friends are enjoying their treats. Give your son a hug for me. He’s lucky he has such a warm and wonderful Mama who can make it all better for him and for the rest of us. Thank you for all you do, Nicole. Now if you’ll excuse me,*my* young son needs some doughnuts too! Yummy, yum, yum! Jonathon rocks! Thanks kiddo for requesting this recipe with no pressure! I have to tell you last nights cookie dough ice cream was a hit! Now tell me, do you normally use the sweetened condensed milk recipe for your go to recipe for ice cream (as a base recipe) for other flavors? The family is wanting me to try mint choc chip. I think the condensed milk worked better than the ice cream machine recipe! Thank you! HUGS! Hi, Lucy! I do generally use those ingredients for other ice creams (I have a number of them already on the site, you should check those out!) but I also sometimes use a marshmallow base. It’s almost more delicious as it’s a bit lighter. Hard to explain. I will definitely be posting something about that soon! Good son! Good momma! ♡ Love the recipes. I’m new to the gluten-free world. I’m excited to try everything! I had no idea there was so much available! I’m glad to know passive-aggressiveness is alive and well in somebody else’s home as well! ;) As usual, these look phenomenal! I am still not getting the hang of scrape and folding! I watch the video and it seems not I do not have enough dough to fold. How do not incorporate the flour if you want it to not be sticky? How do use a light touch and get it flat enough to fold? My dough comes out all risen and nice looking from the refrigerator and I make a mess of it when shaping. Then the bread is dense and not soft like I think is should be. 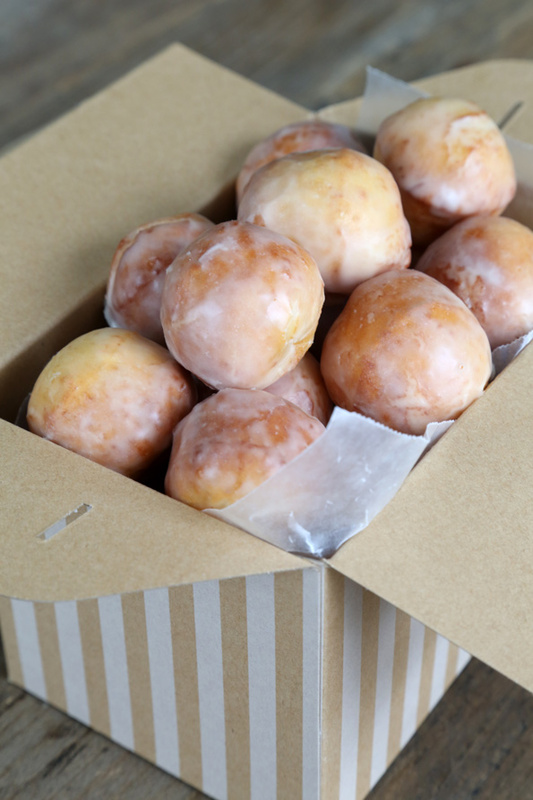 For these doughnuts, I can see that lightness is key to getting fluffy doughnut holes. Help! Deb, you’ll get there! The flour is there to guide the dough but if you don’t press hard it doesn’t get incorporated into the dough. I’d say you should make a batch of dough and don’t worry too much about getting it shaped perfectly, just go for the right consistency—and be sure you’re working with the dough when it’s cold! That helps a whole lot.